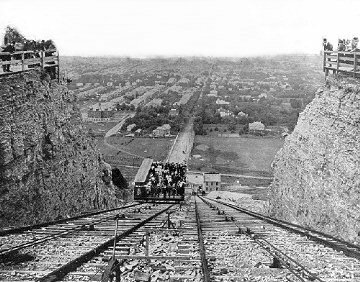 The Wentworth incline was built on a grade of 40% and began operation in August 1895. Track guage was 12 feet 1-1/2 inches, the line 800 feet long. The cars on the incline were connected to operate in balance with the trip taking 1-1/2 minutes at a fare of two cents. Newer cars replaced the original ones in 1910. A rock slide badly damaged the incline structure on November 3, 1913. Operations were resumed on April 30, 1914 after rebuilding, continuing until August 15, 1936. Attempts made by Mountain residents to restore its operation were unsuccessful. After 13 years of dis-use, the incline railway was demolished in 1949. A stub line of the Hamilton Street Railway carried passengers to and from the foot of the incline. Built on a 31% grade, the James Street Incline had two tracks of eight foot guage. On each a car 36 feet long, 14 feet wide and 13 feet high at the lower end travelled on a 700 foot long structure climbing 195 feet. On an incline railway, the cars are usually inter-connected by cables so the cars balance each other. This was not the case on the James Street Incline. Each car was powered by a seperate 125 h.p. steam engine located at the upper end, and could be operated independently. The line got off to a bad start on its first day of operation, June 11, 1892. It had to close down after only two hours of operation because of a shortage of steam caused by the water foaming in one of the boilers. The line re-opened the following day. In 1919, fares were raised from 50 cents to $1.25. Still encountering deficits, the company offered to sell the line to the City of Hamilton. The proposal was rejected by local voters and the line was shut down on Decmeber 26, 1931. However, it was reopened on March 1, 1932 when the City agreed to pick up the operating loss of up to $1000 per year. This reprieve was short lived and the line was permanently abandoned on May 14, 1932. The assets were taken over in 1934 for non-payment of taxes. The track was dismantled in 1942 after sporadic attempts to reopen the line.